Imagine sailing, swimming, windsurfing, kayaking, boating, fishing, paddlesports – all your favourite water activities – all at one scenic, sunny location. That place is Allerthorpe Lakeland Park, located in the county of Yorkshire in northern England, just southeast of the city of York. The area is one of the greenest and most temperate in England, and is a popular tourist destination. The park offers a wide range of activities and amenities suitable for all ages and abilities, including lessons. New to watersports, or wanting to try something new? Allerthorpe Lakeland Park's fully qualified instructors offers lessons in swimming, sailing, windsurfing, powerboating, and even archery or First Aid. 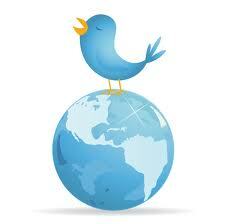 Allerthorpe's is a recognized training centre for the Royal Yachting Association (RYA). At the Allerthorpe Lakeland Park Watersports Activity Centre, "boating" could mean anything from a simple pedal boat through a kayak, canoe, or rowboat to a sailboat or a powerboat. No need to bring your own helmets or splash jackets – these are provided. Or go fishing in the Park's serene coarse fishing lake, surrounded by mature woodland. Fish for carp, roach, rudd, chub, crucians, and tench in the three-acre lake (barbless hooks only – all fish must be returned to the lake). 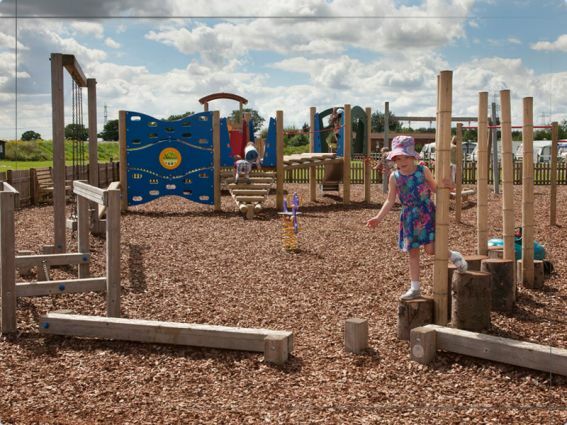 If you prefer not to get wet, or don't want to spend your entire day in the water, other Allerthorpe Lakeland Park amenities include archery, mature woodland, scenic surroundings, a cafe, a pets corner, and a state-of-the-art children's playground. The Lakeside Cafe serves a full English breakfast and a variety of hot and cold meals, all freshly made with local ingredients. September to May, Sunday's lunch is the best of British beef, Yorkshire puddings, and fresh seasonal vegetables, followed by homemade pudding. 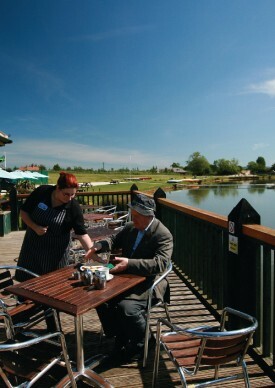 Or simply enjoy a specialty tea or coffee with a scone whilst relaxing on the deck overlooking the lake. The play area is situated at the entrance to the park and the management wanted a playground with 'Wow factor' so asked local company Image Playgrounds to design, build and install their bespoke outdoor playground equipment. The children's playground boasts an innovative lakeside-themed play area, including a Beach House tower system, an exciting Scatterlog Climbing system (above), traditional swings and additional Adventure Trail equipment. The challenge of an Adventure Trail playground for children is to progress from one piece of equipment to the next without touching the ground, promoting balance and agility. Enjoy a fun family day, or bring your caravan or pitch a tent at the campsite and stay longer to enjoy the scenery and to make the most of all the available activities. Facilities include electric hook-up, showers, toilets and a washing up area. The park facilities area popular venue for school outings, company and school team building activities, business meetings, trainings, birthday and other parties, and a growing number of sporting and other events. Guest article from Bob Hornal who has been a financial advisor for over ten years, and is a super visa insurance specialist. In 2010, he set up BestQuote TravelInsurance Agency to make it easier for clients and visitors to Canada to research and purchase travel insurance. Thanks Bob!